Dong Nai province is the South East, the gateway to the east of the city. Ho Chi Minh City, the northern borders Lam Dong, the east borders Binh Thuan, the western border with Binh Duong, Binh Phuoc and Ho Chi Minh City. Ho Chi Minh City, the southern borders Ba Ria - Vung Tau. Dong Nai is stored in the Dong Nai river and a branch of it is La Nga River, La Its rivers are flowing through, the factory hydroelectric Tri An ... Dong Nai terrain includes a valley, plain, wood, low hills, though the land adjacent to the highlands Lam Vienna and Di Linh is relatively high. Most land in Dong Nai province is bazan land, the land of gray and old alluvium very good for cultivation. Therefore Dong Nai in many industrial plants (rubber trees, coffee ...), fruit trees and industrial plants short days. Climate: 2 seasons - the rainy season from 5 months to 10 months of the dry season from 11 months to 4 years later. Average temperature in º C 25.4 - 27.2 º C.
Dong Nai province is industrial development, attract foreign investment by the second largest in the South, just after city. Ho Chi Minh City. Around Bien Hoa city has large industrial parks, many factories, enterprises, companies. Dong Nai has many handicrafts. Ceramics porcelain Dong Nai have beautiful language in the country. Dong Nai has forest rubber, coffee b?t thousands, have banned Cat Tien forest, a forest resources and large. Dong Nai province to tourists can join the eco-tourism in the forest or garden fruit trees, as well as hunting, fishing, yachting on the Dong Nai River, in the epidermis landscape: a Long An , the cultural Suoi Tre, Tri An waterfall, forest that has ... or visit the relics of war, the research only in the neck: a ranked Gon, Binh has ... Dong Nai province is famous for handicrafts such as traditional pottery village, Van Tan, along Dong Nai River by the Vietnamese, professional stonecutter sophisticated tradition of Chinese living near a Long An. Eco-tourism is a way to go for Vietnam Travel companies in Dong Nai. Dong Nai province has many ethnic groups live, most are Vietnamese. Also with the Chinese, Xtieng for Ro, Cham, MA ... Dong Nai has a traditional folk quite abundant, especially the culture of cells ethnic minorities. Religion mainly in Dong Nai are Buddhist and Christian. In addition, a few people in the Protestant, Muslim, Cao Dai, Hoa Hao. Dong Nai is also the homeland of some types of folk musical instrument unique: has Binh, star map, chieng dong, a bar, khen elected, khen each. Local music Tam Pot's ethnic code, one type of music after a written di?u saved transmission in the community that in Dinh Quan district are being restored. The city of Bien Hoa city ways. 30km Ho Chi Minh City, Hanoi months 1.684km way Highway 1A, the Da Lat (Lam Dong) 278km by Highway 20, how to Vung Tau (Ba Ria - Vung Tau) 95km by Highway 51, how Cantho 198km. Railway line North - South from Hanoi through Bien Hoa city to city. Ho Chi Minh City. The Danish-funded project focuses on conducting a broad integrated assessment of the water pollution, identifying the pollution contributions from agriculture, aquaculture, forestry, domestic waste, industrial production and transportation. The assessment will support local partners to find initiatives to reduce the main sources of pollution in each of the sectors, according to the statement released by WWF Vietnam Program over the weekend. The project also includes investigations into options for sustainable finance and reward mechanisms to ensure the upstream forest and farming communities receive adequate benefits in return for the ecological services they provide for down-stream dependants. Further assessment will be conducted toward the potential for other livelihood opportunities, particularly in ecotourism. Tran Minh Hien, country director of WWF Vietnam Program, said the Southern Truong Son, which is contained within the Dong Nai River Basin, is one of WWF Greater Mekong's priority landscapes. The target is $500,000 more than last year’s one of $1.5 billion, but like last year, the actual amount received could double despite the global economic slowdown. Nga pledged that the province would go side by side with business, concentrating on developing support industries to encourage foreign investors. She said the sectors calling for investment were hi-tech industries, machinery, electronics, new materials, IT and telecommunications. Dong Nai will consider pumping more investment into infrastructure upgrades – and training managers and skilled workers. The province has absorbed $3billion in FDI this year, double its target. Of the total, $2.2 billion came from 80 newly-licensed projects and the remainder came from 110 capital-added projects. The director of Dong Nai’s Department of Planning and Investment, Bo Ngoc Thu, said frequent dialogues would continue between enterprises, investors and local authorities to handle any difficulties. Located in a main economic zone in the southern region, the province benefits from proximity to maritime posts and international airports and from progressive policies. It has attracted investment from 32 countries and territories. The province is studying ways of encouraging local business through trade promotion, training staff, information on investment and high priority industries as well as support for land rental. The committee will oversee the implementation of the scheme to protect the environment in the Dong Nai River valley from now until 2020. This agency will coordinate and solve all matters related to the environment of the Dong Nai River and river valley, as well as consider and approve annual and five-year projects and action programs under the Dong Nai River Scheme. The Committee’s chairmanship belongs to the Chairman of the HCM City People’s Committee with a three-year term. The next two-year terms will be assumed by the Chairperson of one of the 12 provinces and cities belonging to the Dong Nai River system. The Dong Nai river system plays an extremely important role to the development of 12 provinces and cities, including HCM City, Dong Nai, Binh Duong, Binh Phuoc, Ba Ria – Vung Tau, Long An, Tay Ninh, Lam Dong, Dak Lak, Dak Nong, Ninh Thuan and Binh Thuan. Approximately 60 industrial and export processing zones are located on the Dong Nai river basin, but just one-third of them have waste water treatment systems. 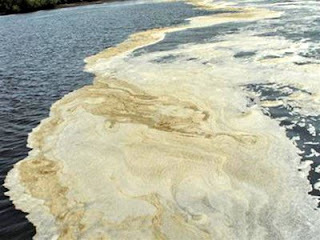 The remaining discharge waste water goes into the river, causing serious pollution to this river.